Impressive 2 bedroom, 3 bathroom split level apartment/maisonette conveniently located just minutes from Boscombe pier, beach, new artificial reef and many restaurants, bars and shops. Bed linen and towels are included. A travel cot and highchair are also provided. Set within the prestigious Burlington Mansions a former Victorian luxury hotel which has been affectionately restored into luxury apartments, each one being unique with many of the original features retained. The flat, suitable for 4 people was newly furnished and redecorated in 2015. It has two entrances and is located on the ground and first floors.Both the master and twin bedrooms have en-suites and there is a further WC downstairs. The lounge/dining area is very spacious with a large window that lets in lots of natural day light. The kitchen is fully fitted with everything to make this flat perfect for a self-catering holiday.Burlington Mansions is a 5 minute walk to the beach at Boscombe, with Europe’s 1st artificial reef and pier. A good selection of shops, restaurants and bars can be found in several directions within close proximity. The centre of Boscombe is 5 minutes walking and Bournemouth centre can be reached by car in 10 minutes. Bournemouth beach is a pleasant stroll along from Boscombe beach or a short ride on the Land Train. Boscombe is a suburb of Bournemouth which is on the map in its own right thanks to a beautiful sandy beach and Europe’s first artificial surf reef. The reef is the size of a football pitch and since its opening in 2009 has fast become a popular destinations for both beginner and experienced surfers. Built in 1888 and fully restored in 2007, Boscombe pier is an impressive sight with its unique aircraft wing design entrance, new decking, lighting and viewing section at the end. Boscombe Cliff Gardens offers an impressive view that stretches from Hengistbury Head, through Bournemouth all the way to Poole Harbour. There is an impressive variety of quality restaurants, pubs and cocktail bars just minutes from the maisonette, several of which offer regular live music.The centre of Boscombe has a good range of high street name and independent stores and on Thursdays and Saturdays a bustling market where you will find fresh fruit and vegetable, meat and fresh seafood stalls as well as many clothing stalls.Once described by Thomas Hardy as the ‘Mediterranean lounging place on the English Channel,’ Bournemouth is an ever popular tourist destination with its 7 miles of award winning blue flag golden beaches. Beach huts were invented here in 1908, and those original huts (the oldest in the world) can still be rented today. The award winning Central Gardens stretch from the sea at Bournemouth pier for several miles down the Valley of the river Bourne and includes the Pleasure Gardens, the Bournemouth Eye Balloon and the Pavillion.The free Air Festival from 18th – 21st August features incredible air displays, attractions and fantastic evening entertainment, and has been selected as a finalist in the 2010/11 South West England Tourism Awards.The Christmas Market from 18th November to Christmas Eve features German inspired chalets, an Alpine chalet style bar, carol singers and a brass band as well as the usual food, drink and present stalls and visits from Santa himself.There is a thriving youth culture here due to the high university population and many language school students. The seeds of new business culture are revolving around surfing and a Californian lifestyle is emerging. Central Southern England is a very popular tourist destination and benefits from not only a spectacular coastline but beautiful countryside and the New Forest. The area has so much to offer, from the country’s finest seafood restaurants, to country pubs; from castles and museums to adventure parks. The New Forest is a national park which combines ancient woodlands, forest glades and wonderful open spaces, great for peaceful walks. Ponies, cattle and deer still graze freely as they have done for centuries. Dorset has amazing beauty with 140km of coastline, from Lyme Regis to Christchurch which features a selection of the UK’s best beaches. Many of the towns and villages have popular tourist pulls: Chesil Bank with the stunning 25km barren pebble beach stretching from Weymouth to Bridgeport; Dorchester with its 6000 years of history, Roman relics and Higher Bockhampton – Thomas Hardy’s birthpalce; and Lyme Regis which was featured in the Meryl Steep and Jeremy Irons film 'The French Lieutenant's Woman' and where the best fossil hunting in the country can be done.In the area, there is a museum for everyone, if the Tank Museum in Bovington doesn’t appeal to you, maybe the Dorset County Museum in Dorchester would, or the award winning Brewers Quay in Weymouth.There are 140 picturesque villages in the region, featuring quaint names like Toller Porcorum, Nettlescombe and Cerne Abbas. Adventure Wonderland is a family fun park with themed rides and entertainment, including shows featuring characters from Alice in Wonderland and boasts one of the largest mazes in the UK. Our guests have described Boscombe Reef Retreat as a 'home from home'. we do our best to provide everything you need to make your holiday a fabulous experience. We love the beautiful historical building of Burlington Mansions and hope our guests will appreciate the combination of a historic building with modern facilities. We offer free WiFi and internet, free parking and have Virgin Media cable TiVo TV with a vast selection of TV channels. The property is suitable for young and old alike. If you have a young family we provide a travel cot, high chair and stair gate. There is a downstairs cloakroom (toilet and sink) and upstairs each bedroom has an en-suite bathroom. Ensuite bathroom to Master Bedroom. Comprises of toilet, sink and bath. 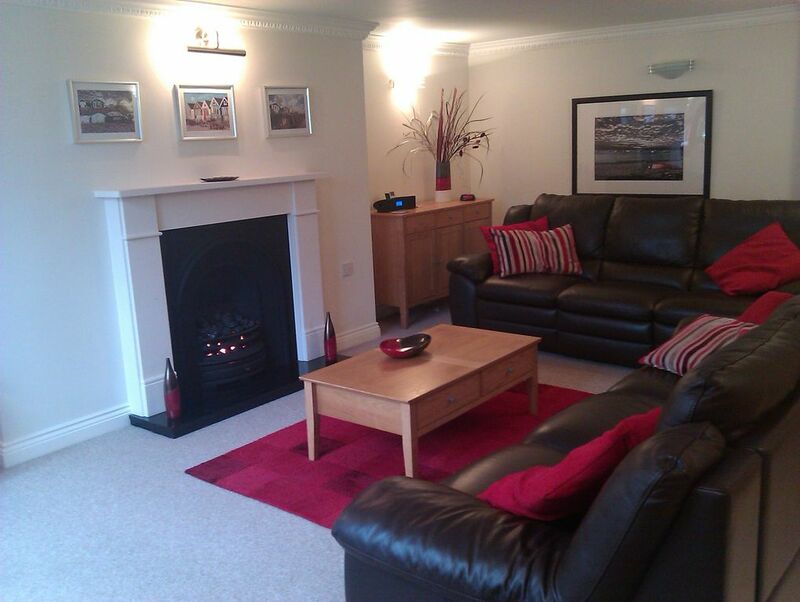 Spacious living Room with two 3 seater comfy leather sofas, free WiFi and TiVo TV package. Coffee table, nest of 3 small tables. Sideboard with supply of games and books for guest use. Apartment is situated on ground floor and mezzanine level. Bedrooms and ensuites are upstairs- approximately 12 steps to upstairs. Our apartment is situated on ground floor and mezzanine level. Bedrooms and ensuites are upstairs- approximately 12 steps to upstairs. There is a cloakroom with downstairs toilet and two further ensuite bathrooms upstairs. A gym and pool table are available free of charge for our guests in the building. Details available on request. Very good accommodation and close to beach and shops etc. Well fitted out accommodation with large lounge and dining area, kitchen nice size with all quality equipment and plenty of storage. Owner kept in touch for any help. Twin bedroom probably not suitable for 2 adults or grown up children.Would visit again. This was our 3rd stay in the apartment in 5 years and it continues to be an excellent choice. There's no signs of wear and tear as it gets older, it's always immaculately clean and tidy, and has everything my growing family needs for a holiday stay. Having small children, staying somewhere with a washing machine and tumble dryer is a must. We were very happy a cot, high chair and step (for sinks) was also provided, reducing our luggage! The location is amazing, so close to the beautiful sandy beach and with child friendly pubs and restaurants within walking distance, and just a short drive into Bournemouth. I would thoroughly recommend this property to anyone staying in the area, 5* as usual. We look forward to returning again soon. Everything was as described on the web-site. Great apartment which was very well furnished and close to the beaches and restaurants. It's hard to quantify but the apartment has a really nice feel to it and my wife and I, plus our son and grand-daughter had an amazing time. Teresa, the landlady, was attentive throughout our stay and ensured we had a special time. Thank-you. We are glad that you and your family enjoyed your stay at Boscombe Reef Retreat despite the unseasonal weather. We hope we have the opportunity to welcome you back when the weather is better so you can have the full experience of what this beautiful area has to offer. Excellent, comfortable and cozy apartment in Boscombe. Kitchen was very well equipped, WiFi was excellent and beds comfortable. Having three bathrooms is definitely a plus, especially after a whole day surfing on a sandy beach. Location was perfect - very quite area, not noise at all at night. Just 5 min walk to Boscombe pier and 10min to ALDI supermarket. Teresa has been extremly helpful and friendly. Another fabulous New Year at this spacious, clean, well equipped, well positioned and in a beautiful building, apartment. Summer or winter this is the best place we have ever stayed in the area. Lovely to wrap up warm and walk along the seafront or drive a few miles to Hengisby Head where the walk with views is beautiful. 10 miles out of town is the fabulous Moors Valley Park with lots of nature trails to walk. If you want to book for next New Year too late...... we are already booked, but we highly recommend for any other time of the year, whether for a short or long stay. The owner, Teresa, is very friendly and prompt in reply to emails. One of the best experiences ever, we will be back! This retreat had everything I needed and then some, it was fully equipped for my needs. I also appreciated how Teresa responded to every detail even checking in with me during my stay, which is unheard of in the U.S. The place was also nicely appointed and comfortable. I would highly recommend it. Adventure Wonderland is a family fun park with themed rides and entertainment, including shows featuring characters from Alice in Wonderland and boasts one of the largest mazes in the UK. For our international guests London is only 2hrs away on a quick direct train line. Bournemouth Station is 10 mins from the apartment where a train can be taken directly to London Waterloo. Waterloo Station is a short walk to many London attractions including The London Eye, Big Ben, The Houses of Parliament and the South Bank of the River Thames where there is a hive of activity with many restaurants, street artists and side walk café’s. Enjoy an active day in London and return to the peace and tranquility of Boscombe Reef Retreat. Your obligations You agree to keep and leave the Property and the furnishings, kitchen equipment, crockery, glasses, clean and in the same condition as upon arrival. You agree not to cause any damage to the walls, doors, windows, floors, fittings, fixtures or furnishings of the Property or to do anything that may be reasonably considered to cause a nuisance or annoyance to us or to any other occupier of adjoining or neighboring properties. Wi-Fi and cable TV are provided. You agree that you are accountable, and assume full responsibility, for all content and activities by you or any guest on the Property when using those services during the period of your stay, including any added fees or charges. You agree to take all necessary steps to safeguard your personal property. No liability to you is accepted in respect of damage to or loss of such property, except where the damage or loss is caused by our negligence. We will assume no liability on account of flight cancellation or delays, loss or damage to baggage or other property, and/or accident or illness. You may not allow more people to stay in the Property than expressly authorised, nor may you significantly change the makeup of the party during your stay in the Property. If you do so, we can refuse to hand over the Property to you, or can require you to leave it. We will treat any of these circumstances as a cancellation of the booking by you. Pets and smoking are strictly forbidden inside the Property. You agree to allow us, or any or our representatives, access to the Property at any reasonable time during your stay for the purpose of essential repairs.